New Movie groom-glam-pups. . HD Wallpaper and background images in the Barbie فلمیں club. That's not a new movie! It's just a game! Can I use it? Just for my Profile pic? PLEASE? OMG LOOOOOOOOOOOL NO! It's the game. About it is a news on barbie.com. This game is DS and Wii not PC. Anyway, you can use the pic and I can't take it because it's not PC version. Sad! This game would be interesting for PC, too! I know it is a game. I know, that this is game, and I think I can buy it, when it will be released. Whoops! 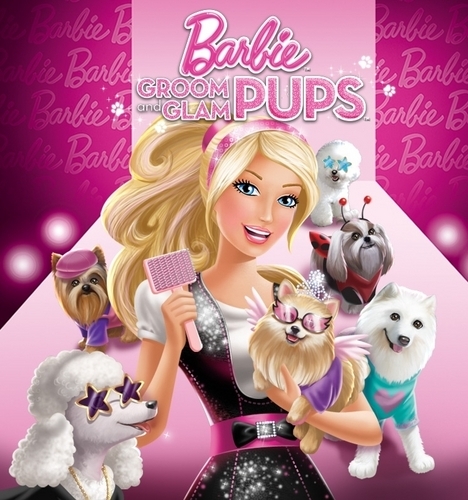 They're beginning to include pink highlights on Barbie's hair! See here, you can see it! Great Margota, I think, that you'll make us pleasant to add here some shots...where it will be released. Does anybody know when it's going to be released?At first I thought it was a new movie! Lol yes. I see already pre-order on Amazon. Thanks for the info Lorina!!!!!!! Well, I'm glad it's a game because if that was a movie I'm afraid I'd have to go down to Mattel HQ and slap someone.